Here are the best of Coronado Island hotels which are perfect for couples and families. Coronado Island is the perfect place for a quiet vacation that allows for easy access to numerous places to explore on the island and a plethora of San Diego attractions.The most iconic resort on the island is the Hotel del Coronado where you will find family friendly resort style amenities similar to Loews Coronado Bay Resort and the Coronado Island Marriott Resort & Spa. 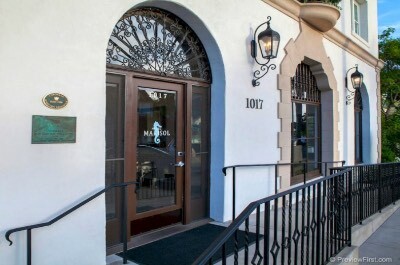 Travelers looking for a boutique hotel should try the Hotel Marisol Coronado or the Cherokee Lodge Bed and Breakfast. Families who want a condominium unit with kitchenettes should stay at the El Cordova Hotel, Coronado Beach Resort or the Glorietta Bay Inn. Value oriented families will like the Best Western Plus Suites Hotel Coronado Island and the simplicity of La Avenida Inn. The Hotel del Coronado is a charming Victorian historic family friendly Coronado Island hotel which offers plenty of amenities onsite and great beach access. Located in the heart of Coronado, the Hotel del Coronado was constructed in 1888 directly on Coronado Beach and has been listed as a National Historic Landmark since 1977. The Hotel del Coronado is a collection of historic Late Victorian and Queen Anne seven story architecturally designed buildings that house 679 rooms and suites which boast a chic tropical interior. Rooms within the historic Victorian building have varying floorplans and sizes with a choice of bedding and different views that range from resort, gardens, beach and Pacific Ocean Views. Few rooms within the historic portion of the hotel have balconies. Rooms within the newer Tower/Cabana buildings are larger with a choice of bedding and a private balcony with resort or ocean views. Junior suites within the historic hotel are 500 square feet with varying floorplans, a choice of bedding and some offer balconies that sport an ocean view. One-bedroom historic suites are 600 square feet with a separate living room and private balcony with views of the gardens or the Glorietta Bay. Two-bedroom historic family style suites range from 750 to 1,200 square feet with a separate living room, children amenities, bunk beds, 2-bathrooms and a view of Glorietta Bay. One-bedroom suites within the Tower range in size from 900 to 1,200 square feet with a number of layouts that some units have fireplaces, 2-bathrooms, separate living room and private balcony with views of the coast or Pacific Ocean. The Hotel del Coronado has a perfect spot on the beach where you will find plenty of space to lounge as well as watersport activities such as complimentary surf lessons and other complimentary watersport equipment. The Hotel del Coronado has a full time entertainment staff that keeps things active and children will enjoy the activities within the kid’s club. The Hotel del Coronado has two freshwater swimming pools including an adults-only with poolside service, a fitness center and a full service spa. Dining onsite includes Sheerwater for all three meals, the Sun Deck has Mexican, Enos serves pizza as well as 1500 OCEAN prepares dinner seaside and Sunday brunch is perfect at the Crown Room. Nightlife at this Coronado Island hotel includes a quiet drink at Sun Set Bar and Babcock and Story Bar has a lively atmosphere. The Loews Coronado Bay Resort is a fantastic luxury Coronado Island hotel for families who want plenty of resort style amenities onsite as well as easy beach access. Located between Imperial Beach and Coronado along the San Diego Bay, the Loews Coronado Bay Resort is situated on 15-acres of manicured gardens which are within a 5-minute walk to Silver Strand State Beach and a short 10-minute drive to downtown Coronado. The Loews Coronado Bay Resort has a modern three floor architectural style with 439 rooms and suites that offer a contemporary decor. Rooms are sized at 430 square feet with a choice of bedding, floor to ceiling windows and most rooms have a private balcony with pool, marina, resort or San Diego Bay views. One-bedroom Coronado Bay and Bayside suites range in size from 750 to 850 square feet with a separate living room that has a sofa sleeper and private balcony with bay views. One-bedroom Vice-Presidential and Presidential suites are 1,750 square feet with a separate living room, 2-bathrooms and 3-balconies with panoramic views. 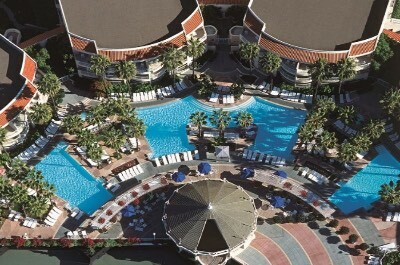 Loews Coronado Bay Resort is a 5-minute walk to Silver Strand State Beach along a private path. Once at the beach you will find plenty of space to lounge on the sand and plenty of watersport activities including swimming. The Loews Coronado Bay Resort has an 80-slip marina where you can dock or arrange for your favorite watersport adventure and there are complimentary gondola rides. Other attractions nearby require a 5-mile drive to Imperial Beach Pier, Downtown Coronado and the Living Coast Discovery Center. Activities at Loews Coronado Bay Resort are plentiful with a full entertainment staff that organizes events for adults as well as children. The property has three freshwater swimming pools that include a kid’s pool, family pool and an adults-only pool with cabanas as well as poolside service. Other amenities onsite include tennis courts, fitness center and a full service spa. Dining at the resort includes Crown Landing for all three meals; the Silver Strand Exchange has grab-n-go quick bites and La Cantina serves poolside for lunch. Offsite dining requires a short drive where you will find Calypso Cafe, Tacos El Gordo De Tijuana and Sea 180 Coastal Tavern for seafood. Nightlife at this Coronado Island hotel is plentiful at Loews Coronado Bay Resort with live DJ’s around the pool, dive-in movie nights and Cays Lounge offers live music on selected nights. If you are looking for a resort style Coronado Island hotel that is superb for families and all types of travelers then you should try the Coronado Island Marriott Resort and Spa. 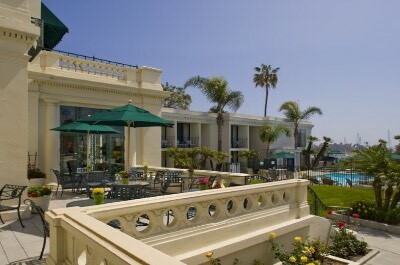 Located on the northeastern portion of the island 1-mile from downtown and overlooking the San Diego Bay, the Coronado Island Marriott Resort and Spa is situated on 16 acres of manicured gardens which is only 3-blocks from the Coronado Ferry Landing and 5-minutes from Coronado Tidelands Park. The Coronado Island Marriott Resort and Spa has a modern three story architectural design with 300 rooms and suites which boast a contemporary chic interior. Standard guest rooms have 500 square feet with a choice of bedding, floor to ceiling windows and a private balcony that offers a view of the city skyline, the pool area or San Diego Bay. One-bedroom Executive suites are sized at 710 square feet with a separate living room, floor to ceiling windows and 2-balconies which feature views of the San Diego Bay and city skyline. Junior cottages offer 662 square feet that features an open floorplan with a sofa sleeper, kitchenette and a patio that has views of the gardens as well as the bay. One-bedroom cottages have 920 square feet with a separate living room, kitchenette with a dining area and 2-patios with views of the bay as well as city skyline. The Coronado Island Marriott Resort and Spa has a great bay front location where you can enjoy a plethora of watersport activities and you are less than 2-miles to Coronado Municipal Beach. The Coronado Island Marriott Resort and Spa boasts easy access to the Coronado Ferry Landing which makes for stress-free exploration of San Diego’s favorite attractions like the San Diego Zoo, Balboa Park and the Gaslamp Quarter. The Marriott Resort and Spa Coronado Island hotel has three freshwater swimming pools which overlook the San Diego Bay, a fitness center and a full service spa onsite. Dining at the resort includes all three meals at Current Restaurant and Tides Restaurant offers light snacks. Dining options offsite within walking distance include Il Fornaio for Italian, Peohe’s prepares seafood and Lil’ Piggy’s Bar-B-Q. Nightlife includes a quiet drink while gazing at the San Diego skyline from your balcony or a craft beer at the Coronado Brewing Company and you will find a pub atmosphere at Nicky Rottens. 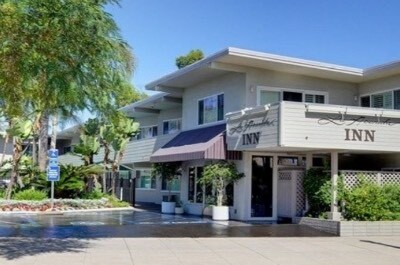 When you are seeking a value oriented Coronado Island hotel that is perfect for on the go travelers who want easy access many attractions and the beach then the La Avenida Inn is ideal for you. Located within the southeastern portion of the island in the heart of Coronado, the La Avenida Inn is situated within a short 5-minute walk to Coronado Municipal Beach and the Vietnam Unit Memorial Monument. The La Avenida Inn has a modern two floor architectural style with 29 rooms and suites that have a contemporary decor. Standard rooms have 230 square feet with a choice of bedding and a view of the courtyard and pool. The Coronado suite is larger with an integrated sleeping/living area that has a sofa sleeper and views of the courtyard and pool. The one-bedroom Del suite has a separate living room, small kitchenette (microwave and refrigerator) and a private balcony with views of the Hotel del Coronado. The La Avenida Inn is a short 5-minute walk to Coronado Municipal Beach where there is plenty of room to lounge and an assortment of watersport activities. You are also within walking distance to the Coronado Visitor Center where you will find a museum, several art galleries like the Dan McGeorge Gallery and you are an easy drive over the Coronado Island Bridge from Petco Park, Little Italy as well as Seaport Village. The La Avenida Inn Coronado Island hotel has a freshwater swimming pool with sundeck and a picnic area but there is not a fitness center or restaurant onsite. Dining includes a complimentary continental breakfast and you will find numerous offsite dining selections within walking distance such as the Tavern for pub grub, Island Pasta Coronado serves Italian as well as Islander prepares seafood dishes. Nightlife can include a drink at Mc P’s Irish Pub and Grill or you can visit the Lamb’s Players Theatre for live entertainment. 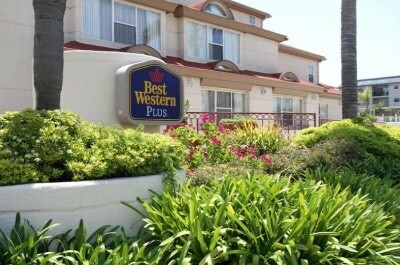 Families that are looking for a value oriented mid-range Coronado Island hotel that provides comfortable accommodations and allows for easy access to many nearby attractions should stay at the Best Western Plus Suites Hotel Coronado Island. Located within the northeastern portion of the island and 7-blocks from downtown, the Best Western Plus Suites Hotel Coronado Island is situated 1-mile from Coronado Municipal Beach and less than 3-blocks to the Coronado Ferry Landing. The Best western Plus Suites Coronado Island hotel has a modern three story architectural design that features Spanish ascents with 60 rooms and suites which sport a contemporary interior. All rooms and suites are furnished with a small kitchenette that contains a refrigerator and microwave. Standard rooms are spacious with a choice of bedding and views of the surrounding area. One-bedroom suites are larger with a choice off bedding, a separate living room that contains a sofa sleeper and views of the surrounding area. The Best Western Plus Suites Hotel Coronado Island is about 1-mile from the Coronado Municipal Beach where you will find sufficient area to lounge on the sand and play beach games as well as a plethora of watersport activities that ranges from kayaking to windsurfing to standup paddleboarding. 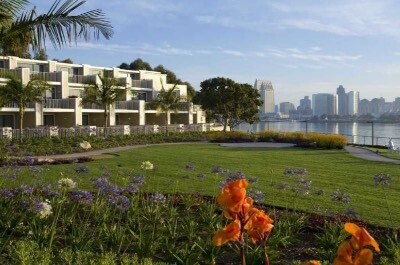 You also have excellent access to the Coronado Tidelands Park as well as the Coronado Ferry which connects you to San Diego where you will find the Gaslamp Quarter, the U.S.S. Midway Museum and the San Diego. The Best Western Plus Suites Coronado Island hotel has a freshwater swimming pool with a sundeck but there is not a fitness center or restaurant onsite. Dining at the property includes a complimentary breakfast and you will find a plethora of dining options within walking distance that includes Tartan for American dishes, Saiko Sushi as well as Peohe’s prepares seafood specialties. Nightlife can include a craft beer at Coronado Brewing Company or a cold beverage at the Little Club. The El Cordova Hotel on Coronado Island is a charming mid-range Coronado Island hotel for couples and families who want to be close to the beach. Located 2-blocks from downtown within the southwestern portion of the island, the El Cordova Hotel on Coronado Island is situated within a lush Spanish style garden with a courtyard and is a 5-minute walk to Coronado Municipal Beach. 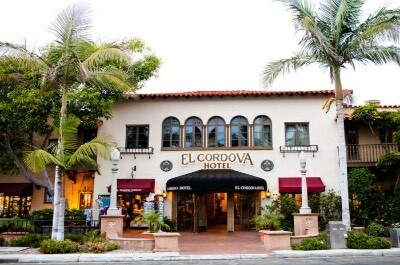 The El Cordova Hotel on Coronado Island is contained within a historic 1902 Spanish two floor architecturally styled building with 43 rooms and suites which boast a Spanish decor. All rooms have a view of the courtyard from various sized windows. Standard and Deluxe rooms range in size from 200 to 250 square feet with a queen size bed as well as one-bedroom suites have between 500 to 600 square feet with a separate living room that contains a sofa sleeper and a full kitchen. Two-bedroom suites range in size from 800 to 1,000 square feet with a separate living room, formal dining room, full kitchen and 1-bathroom. Deluxe two-bedroom suites are larger with 2-bathrooms, separate living and dining rooms and a full kitchen. Casa Grande is the largest suite with 1,500 square feet, two-bedrooms, full kitchen, separate living, meeting space as well as a balcony with views of the Pacific Ocean and the Hotel del Coronado. The El Cordova Coronado Island hotel is just a short walk to the Coronado Municipal Beach where you will find plenty of relaxing sand and space for beach games as well as numerous watersport adventures. The El Cordova Hotel on Coronado Island is within within walking distance to the Museum of History and Art as well as Glorietta Bay. The El Cordova Coronado Island hotel has a nice freshwater swimming pool that features a sundeck surrounded by the gardens, twelve shopping boutiques with a variety of merchandise as well as in-room massages but there is no fitness center. The hotel offers several dining selections onsite which include Miguel’s Cocina and Miguelitos for Mexican dishes as well as the Brigantine Seafood Restaurant. Dining options offsite within walking distance include Village Pizzeria for Italian, Lobster West prepares seafood and Leroy’s Kitchen plus Lounge serves American cuisine. Nightlife can consist of a quiet walk on the beach at sunset, a live performance at the Village Theater or a cold libation at Nicky Rottens Coronado. When you are searching for an intimate Coronado Island hotel that is ideal for couples and visiting military personnel then the Cherokee Lodge Bed and Breakfast is perfect for you. 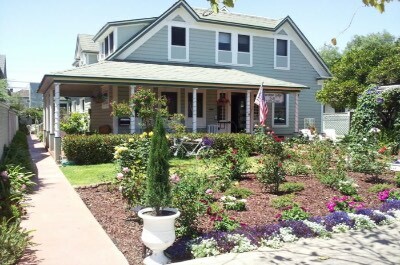 Located 2-blocks northwest of downtown Coronado, the Cherokee Lodge Bed and Breakfast is situated only 3-blocks from Coronado Municipal Beach and is only 3-miles from the U.S.S. Midway Museum. The Cherokee Lodge Bed and Breakfast is composed of three unique late 19th century Craftsman two story architecturally designed buildings that contain 12 rooms which have an individually distinct contemporary interior. Rooms range in size from 161 to 265 square feet and offer a wide choice of bedding options. There are two rooms that share a hall bathroom and the other ten rooms have an in-suite bathroom. The Cherokee Lodge Bed and Breakfast is a quick 10-minute walk to the beach where you will find plenty of activities both on land and water. You are also within an easy walk to Spreckels Park, the Vietnam Unit Memorial Monument and shopping at the Coronado Ferry Landing. The Cherokee Lodge Bed and Breakfast also has great access to many attractions within San Diego that include the Gaslamp Quarter, Little Italy and San Diego Zoo which are all within a 6-mile drive. The Cherokee Lodge Bed and Breakfast Coronado Island hotel has a nice courtyard for you to use to relax but there are no facilities onsite. Dining includes complimentary breakfast at a nearby restaurant with a voucher and you will find a plethora of dining selections within walking distance that include the Islander for seafood, Clayton’s Coffee Shop and Cafe 1134. Nightlife can include a walk to Mc P’s Irish Pub and Grill or Danny’s Palm Bar and Grill for cold libations as well as a live performance at the Village Theater. If you are seeking a family friendly mid-range Coronado Island hotel that boasts condominium accommodations and is close the beach then you should stay at the Coronado Beach Resort. Located within the southern portion of the island adjacent to the Hotel Del Coronado, the Coronado Beach Resort is situated 2-blocks from Coronado Island Beach and Glorietta Bay. The Coronado Beach Resort has a Spanish Mediterranean three story architectural design with 190 condominium units that feature a contemporary decor. All condominiums at the Coronado Beach Resort are furnished with a kitchenette that features a microwave; refrigerator, a two-burner stove and some units have dishwashers. Studios are 354 square feet open floorplan that contains a queen size Murphy bed within the living area. One-bedroom units have 496 square feet with a separate living room that contains a sofa sleeper and some units are equipped with a fireplace. Two-bedroom condominiums are sized at 624 square feet with a separate living room (some have fireplaces), a sofa sleeper, 1.5-bathrooms and some units have balconies. The Coronado Beach Resort is a superb place to begin your adventures of the area including a short walk to Coronado Island Beach where you will find plenty of sand and watersport activities. The Coronado Beach Resort is within a short distance to outstanding attractions such as a tour of the historic Hotel del Coronado, Coronado Tidelands Park and you are within 4-miles to Balboa Park, U.S.S. Midway Museum as well as Petco Park. The Coronado Beach Resort does have a rooftop deck, fitness center, barbeque grills and a game but does not have a freshwater swimming pool. You do have access to the facilities at Loews Coronado Bay Resort where you will find numerous freshwater swimming pools and restaurants. The Coronado Beach Resort does not have a restaurant onsite and I you are there on Monday you will receive a free continental breakfast. Dining starts with a leisurely cooked meal in your room or you can venture to one of the many offsite dining options within walking distance such as the Tavern for pub are, Stake Chophouse and Bar as well as Miguelitos prepares Mexican cuisine. Nightlife includes a quiet drink and star gazing from the rooftop deck or you can try Lamb’s Players Theatre for live theater as well as Wine a Bit Coronado for a nice glass of wine. When you are searching for a charming historic boutique Coronado Island hotel that is ideal for romantic getaways and families then you should try the Glorietta Bay Inn. Located within the southern portion of the island 1-block from Glorietta Bay, the Glorietta Bay Inn is within easy 3-block walking distance to Coronado Island Beach and 1.5-miles from the Coronado Ferry Landing. The Glorietta Bay Inn has 11 mansion rooms that are situated within the 1908 Italian Renaissance architecturally design mansion as well as another 89 rooms and suites within a more recent addition constructed in the 1950s. Romantic couples will be delighted with the eleven individually decorated rooms and suites within the historic mansion. These 11 units range from well-appointed rooms with amenities such as fireplaces and balconies with views of Glorietta Bay to one-bedroom suites which feature kitchenettes. The 89 rooms and suites in the newer section of Glorietta Bay Inn start with a 160 square feet single bed room for budget travelers to larger Deluxe and Bay view rooms that offer a choice of bedding and a balcony with bay or garden views. One-bedroom junior suites have a small separate living room with a kitchenette and larger one-bedroom suites are furnished with sofa sleepers as well as a full kitchen. Two-bedroom suites offer a separate living room with a sofa sleeper, 2-bathrooms and a kitchenette. Suites offer various views but no private balconies. The Glorietta Bay Inn offers an easy 10-minute walk to Coronado Island Beach where you will find plenty of watersport activities and nice sand for lounging. You are also within a 1-mile walk to several attractions like Glorietta Bay Park, Coronado Tidelands Park and the Coronado Visitor Center which contains a museum of the island. The Glorietta Bay Inn Coronado Island hotel has a freshwater swimming pool which features a nice sundeck but there is not a fitness center or restaurant onsite. Dining at the Glorietta Bay Inn starts with a free continental breakfast and there are numerous offsite dining choices within walking distance that include Miguel’s Cocina for Mexican dishes, Brigantine Seafood Restaurant as well as Primavera Ristorante prepares Italian specialties. Nightlife includes a quiet evening in the Music Room onsite listening to piano music or you can try the Coronado Playhouse for live theatrical performances as well as the Stout Public House for cold libations. The Hotel Marisol Coronado is a romantic boutique Coronado Island Hotel which is ideal for couples looking for solitude and easy access to the beach. 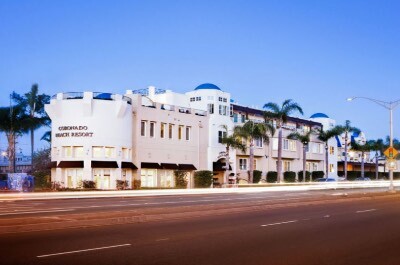 Located in the southern portion of Coronado Island just steps from downtown, the Hotel Marisol Coronado is situated 2-blocks from Coronado Island Beach and 1-mile from the Coronado Ferry Landing Shopping Center. The Hotel Marisol Coronado is a historic building that was constructed in 1926 with a Mediterranean three floor architectural style that contains 15 rooms and suites which sport a chic decor. Standard queen rooms are 227 square feet and king rooms have 295 square feet. Each of the rooms offers a view of the surrounding neighborhood. Junior suites are sized at 354 square feet with an open floorplan that contains a sofa sleeper and views of the surrounding area. The Marisol Coronado Island Hotel boasts easy access to Coronado Island Beach where you will find plenty of places to relax on the sand and the property has complimentary beach equipment for you to enjoy. The Hotel Marisol Coronado has a great spot for you to start your explorations of the island with many attractions within walking distance or you can ride one of the complimentary bicycles to places such as the Museum of History and Art, Spreckels Park as well as the Vietnam Unit Memorial Monument. Other nearby attractions within an easy 2-mile drive over the famous Coronado Island Bridge includes the U.S.S. Midway Museum, Petco Park and the Gaslamp Quarter. The Marisol Coronado Island Hotel does not offer a freshwater swimming pool, fitness center or restaurant onsite. Dining includes a free continental breakfast to start your day and there are numerous fine restaurants within walking distance that include Leroy’s Kitchen plus Lounge, Chez Loma prepares French specialties as well as Village Pizzeria or Italian. Nightlife includes a wine and cheese party on the weekends and there are live performances at Lamb’s Players Theatre as well as a lively atmosphere at Mc P’s Irish Pub and Grill.